Hotel Diablo has captured Hollywood's darker side with "The Return To Psycho, California". The band formed in early 2011　and quickly started writing as well as playing select shows in Hollywood and soon had enough material for an entire album. 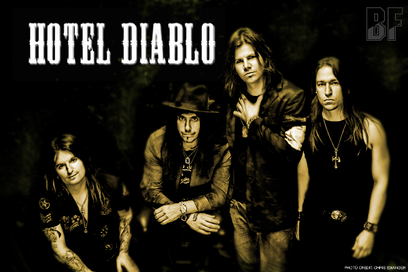 HOTEL DIABLO's full length debut "The Return To Psycho, California" was produced by Gilby Clarke (Guns N' Roses, Rockstar Supernova) with additional production by underground LA producer Matt Starr (Ace Frehley, Beautiful Creatures), and will be available worldwide starting September 25th on Scarlet Records.